Link: the cool hunter – JAPANESE APARTMENT BLOCK – TOKYO. What we most love about all things Japanese is that they vary so radically from intelligent design to the completely wacky. The most recent work from New York based designers Arakawa and Gin is a wonderful example of the latter. The creative duo have unveiled a small and most unusual apartment block based in Mitaka, Tokyo. 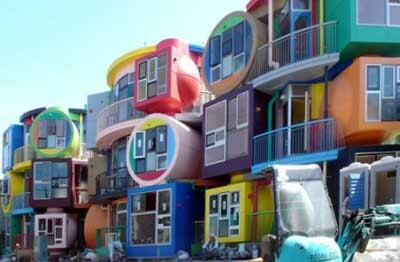 Reversible Destiny Lofts are eye-catching brightly painted lofts that look like a McDonald’s play ground through the eyes of someone on LSD. The architecture looks like the aftermath of a size 3 earthquake, a little shaken and lopsided. There is a method behind the designers madness however. haha cool! At first I thought this is a playground for kids =P. Japanese people are very creative!